Church Collects More Than 10 Million Rubles to Help Ukrainian Civilians. 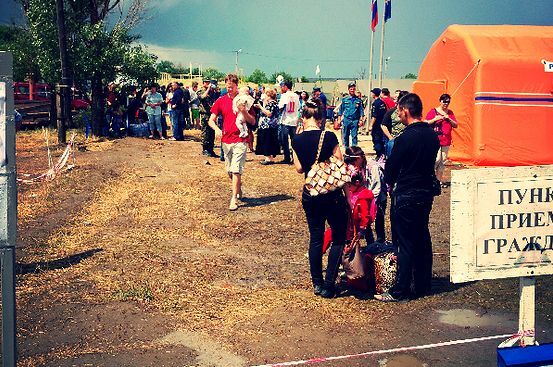 The largest number of forced migrants is being welcomed in the Rostov region. News Service | July 16, 2014. PRAVMIR. The first meeting of the interdepartmental working group for the assistance of the civilian population of Ukraine was held on July 15, 2014, at the Synodal Department for Church Charity and Social Service. It announced the total amount of funds collected received on the Synodal Department’s account. By July 16, the total amount of collected funds equaled 10,752,000 rubles, stated the press-service of the Synodal Department for Charity. The largest number of forced migrants is being welcomed in the Rostov region. According to Priest Eugene Osyaka, head of the Social Department of the Rostov-on-Don Diocese, this number amounts to 30,000 people in the region’s territory. He added that there are currently problems with nutrition in the temporary accommodation centers. The Church Aid headquarters in the city of Rostov-on-Don has received over 1,800 targeted applications with requests for help from Ukrainian refugees who are already living with relatives, as well as offers of assistance to internally displaced persons from Ukraine with their accommodation and employment. During the meeting, participants discussed the working group’s immediate steps to help the civilian population of Ukraine and the expenditures of general church funds. In addition to permanent members of the working group, the meeting was attended by the heads and representatives of the social departments of the Rostov-on-Don, Ekaterinodar, Kaluga, Novosibirsk, Simferopol, Novorossiysk, Belgorod and Yekaterinburg Dioceses.